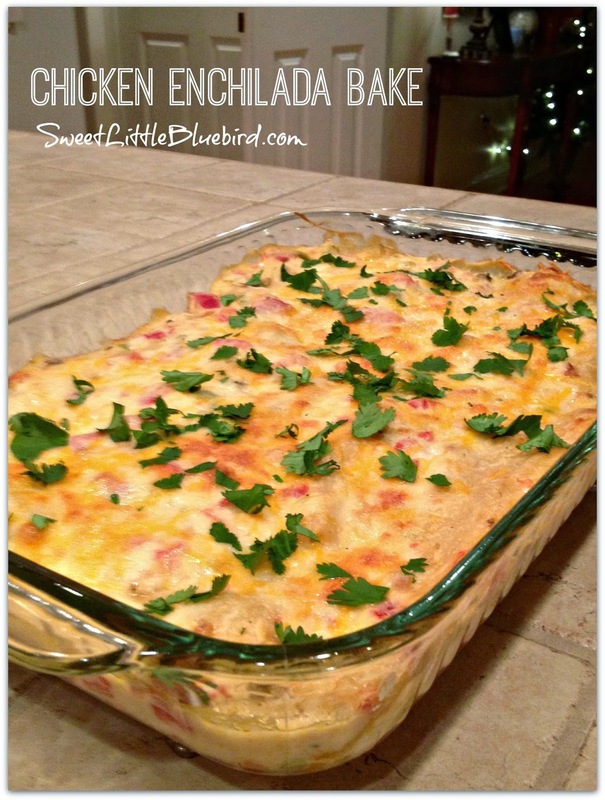 Today I have a delicious recipe to share that is loaded with flavor, smothered in goodness – Chicken Enchilada Bake! When my 16 year old daughter said, “This tastes like it came from a restaurant!” I knew it was good! 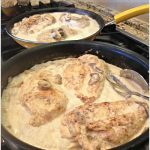 Back in November I shared a Creamy Chicken Bake that has become one of my most popular recipes to date. A reader on Facebook mentioned that she makes enchiladas with a similar sauce. 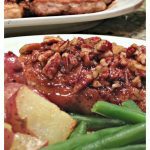 I did a Google search and found Chicken Enchiladas II on Allrecipes.com that had rave reviews and similarities to the sauce on the Chicken Bake. I decided to give the enchiladas a try, changing up the recipe a bit. 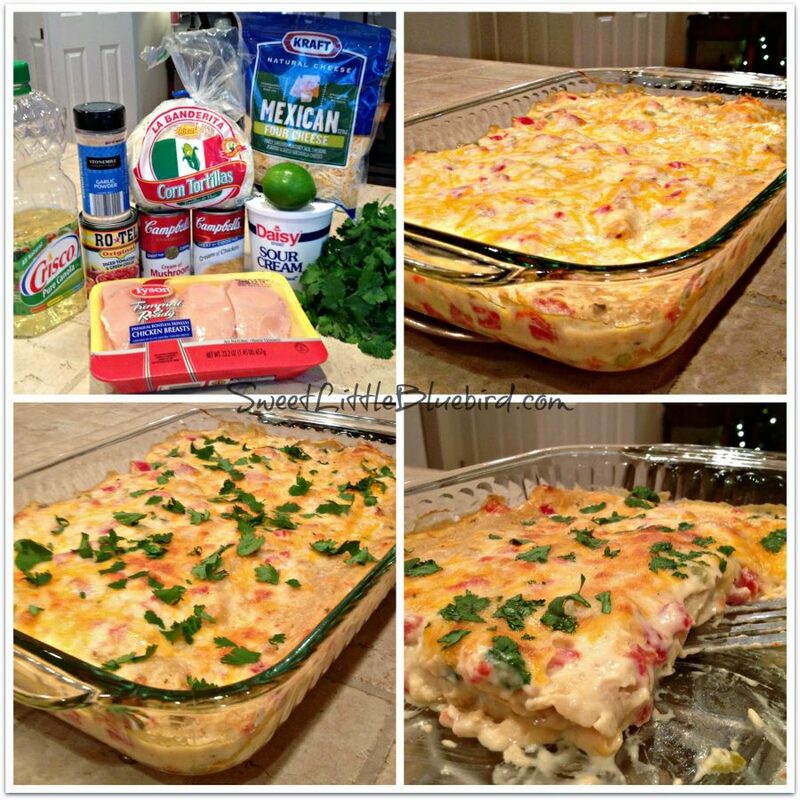 When deciding what ingredients to use, I remembered a comment a reader left on my Creamy Chicken Bake, stating she might add Rotel to the recipe, which is what I did with this recipe! SO DARN GOOD! Perfect! 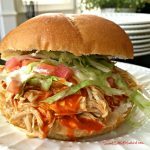 I made this recipe using corn tortillas, but you can substitute with flour. Please note, corn tortillas are by far the best for this recipe! If you use flour tortillas, skip the softening process. You can also substitute the Mexican blend cheese for cheddar. I highly recommend using fresh squeezed lime juice and cilantro when serving! Not a fan of canned soups? Make your own homemade condensed cream soups! Prepare your corn tortillas (*see note below) and set aside. In a large bowl mix the soups, rotel, sour cream, garlic powder and milk. Reserve 3/4 of the mixture and set aside. With the remaining 1/4 of mixture, add the cooked chicken and 3/4 cup shredded cheese. Next, add a little sauce to the bottom of the baking pan, enough to coat the bottom lightly (see photo). Spoon chicken mixture into each tortilla, roll and place seam down in baking dish, side by side (see photo). 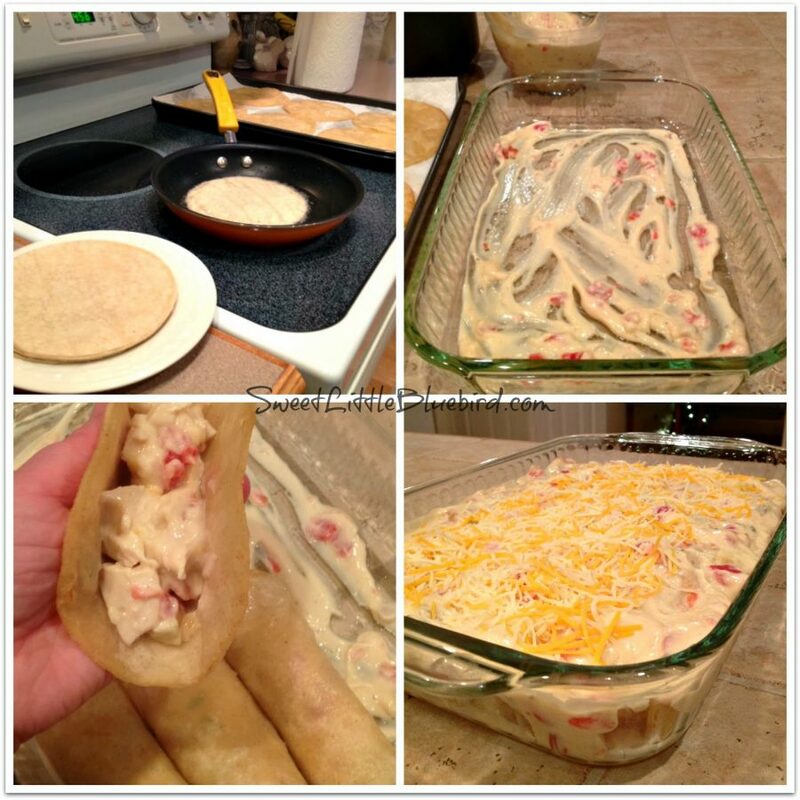 Spoon the reserved sauce evenly over rolled tortillas and top with remaining cheese. Place in oven on middle rack and bake for approximately 30-35 minutes until cheese bubbles. Serve hot with fresh cilantro sprinkled on top and fresh squeezed lime juice. Enjoy! Can this be frozen and cooked later? I have made a similar recipe for years. 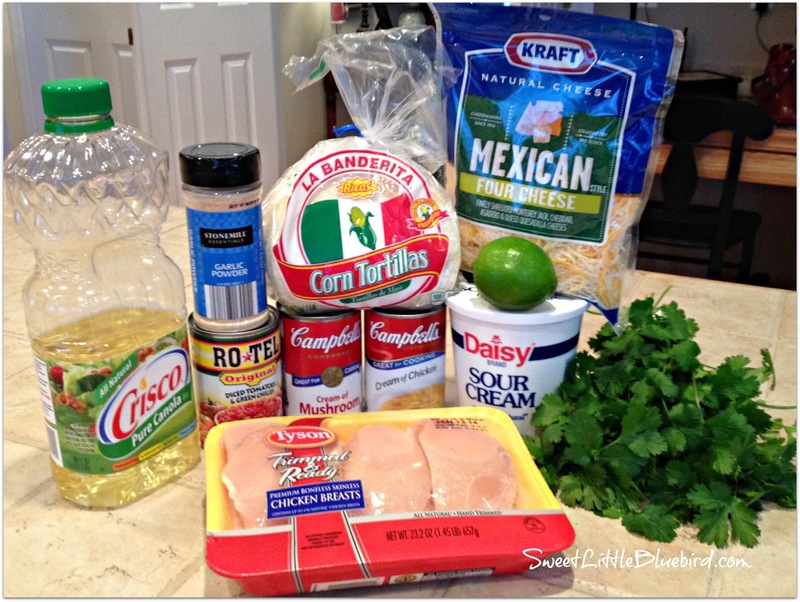 I use cream of chicken soup an a small can of green chilies added to the sauce and the chicken mixture. I also add onions to the chicken mixture. I think my sister-in law got the recipe from a magazine in the 70.s. everyones favorite! Can I prepare it the night before and bake it the next day? 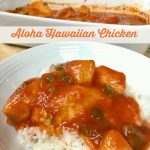 Would this recipe work with ground beef instead of chicken? If you don't want to fry and roll the tortillas just layer like lasagne and bake. Tastes delish. Thanks for the recipe. Making tonight. Just wish I had some cilontro. great. Any Suggestions on making a Beef Enchilada Bake???? I have made a receipe simular to this receipe since the mid eighties. I used tortilla chips instead of corn tortillas. I just layered the ingredients starting with the soup mixture and ending with cheese. My family loves it!!! I spray the tortillas with PAM on one side and stack them in a dish. I zap them in my microwave oven for one – two min. This softens them quickly and w/o being greasy. Great to know! Thanks so much for the idea.